Stuart Henley is an exploration geologist, based in Westport. He has worked in all the coalfields on the West Coast. 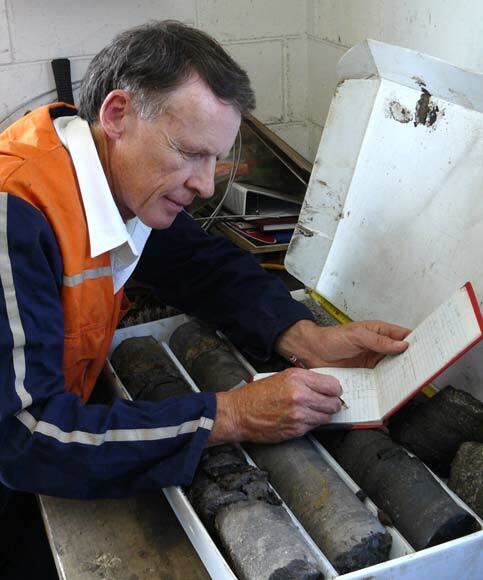 He is shown here examining drill core from the Buller coalfield. Minerals and mining are in my blood. My father’s grandparents arrived in the Buller during the 1860s gold rushes, while my maternal grandfather was a Scottish coal miner who came to Westport in the early 1900s. As a small child I listened to stories of coal and gold mining, and eagerly examined the gold-speckled pieces of quartz from the Red Queen mine in the Mōkihinui valley. During visits to my grandparents’ place at Seddonville, I developed a real affinity with the bush and mountains of the West Coast. When I was at Buller High School the coal industry was in decline, and the future looked bleak for mining. I started at Canterbury University with the idea of becoming a mapmaker. Influenced by lectures by Max Gage about mining and coal exploration, I found geology far more interesting. For a few years I worked for the Ministry of Works in Westport, and then secured a position with State Coal Mines. In 1987 Coal Corp (later named Solid Energy) was created, and after a few teething problems, coal mining really took off. In the last 25 years I have been involved with coal exploration and mine development in the Buller, Greymouth and Reefton coalfields. Much of the exploration has been in remote, mountainous terrain, and reading about the endeavours of the early coal prospectors and coal miners has always been inspiring. Fifty or more years ago the transport of exploration drilling rigs required great effort, whereas today helicopters complete this in a few hours. Rehabilitation, something unheard of 30 years ago, is now an integral part of mine planning. Westport has been my home, and a large portion of my life has been spent in the mountains between Greymouth and Karamea. Mineral exploration, tramping and caving are outdoor activities I have enjoyed in this area, and the great variety of rock types, landforms and ecology make the northern West Coast a special place for me to live in.